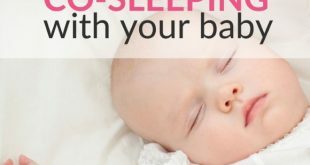 Top Tips To Make Baby Sleep (Much) Better Without Any Crying! “Does your baby sleep through the night already?! What did you DO?? What did they do that I don’t??? Well, chances are that the lucky parents didn’t do anything if the infant is still really young. For the rest of us, things do get better. 50% of all babies sleep through the night at the age of 1. Ehh, wait, 50%… What about the rest..? Yeah, there are definitely good reasons to learn some about baby sleep patterns and how you can help your baby sleep through the night. What you do as well as where the baby sleeps might have a real impact. There are also safety issues to think about, to decide where your baby should sleep as well as in what position. As I’m sure you’ve heard, babies should sleep on their back, to reduce the risk of SIDS (Sudden Infant Death Syndrome). Our oldest child slept through the night at the age of 4 (years!). My second slept through when she was one year old and my youngest at 4 months old. But then he started waking up again as many do at around 6 months old. A few months later he slept through the night again with no problems at all. The big difference between how we acted with our kids is when we started helping them to sleep better. 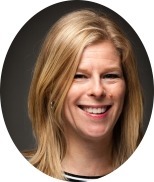 Still, I now know I started way too late with our girl (Not to mention our oldest son; no training at all!) – when she was 10 months old. In just a few days she went from waking up every second hour to twice a night. Two months later she slept the whole night. With our youngest baby, we gently started his baby sleep training when he was two months old. Well, unfortunately, there is no magic key that will solve all your baby sleep issues. The goal is though to teach the infant to fall asleep on his or her own and to get to used to eat only at daytime. 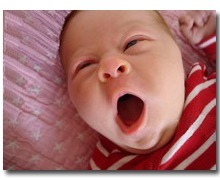 Before listing the tips, here are a few words about baby sleep patterns. Would you want to sleep like a baby..? Probably not! Babies, especially really young ones have much more light sleep than adults and older children. This means that they have more opportunities to wake up and when they do, many infants need help to get back to sleep. Follow this link to learn some more about your baby’s sleep pattern. So other than biding your time, waiting for your child to get older, the key is to teach him to self-soothe and go back to sleep on his own. A bedtime routine may seem like a laugh when your child is newborn. And it is. But at around two months according to my experience, it is possible to get into a routine that makes your baby want to go to sleep at around the same time every night. Depending on how much time you want to allocate to this, you could give your baby a bath and a massage or both before putting him to bed. Or you can sing a lullaby or read a story. With three kids to put to bed, my routine for our baby was merely to wash him (no bath), put on a new diaper and pajamas, put the lights out and put him to bed with his stuffed animal and pacifier. I swaddled his lower body and one arm until he was a few months old. I might have to go in and give him his pacifier a few times before he falls asleep, but that I can handle while helping my other kids to get ready for bed. You need to introduce a morning routine too, getting up at about the same time every day, to make this work smoothly. Do you think your baby wakes up too early in the morning? Here’s some advice. Other than having some free time in the evening, there is another great advantage with having your child falling asleep in his bed – he will not become terrified waking up in the middle of the night! If your baby always falls asleep in your arms, he will start believing that this is his bed, everything else must be terribly wrong. Would you go back to sleep if you found yourself on the floor instead of in your bed waking up in the middle of the night? Probably not. The same thing goes for a baby. To help your baby accept sleeping in a crib, click here. Yes, they can go to sleep by themselves if not hungry! This you should do both at night and every time your baby takes a nap in the daytime. During his or her first weeks your baby will probably fall asleep at your breast every time he nurses (or with the bottle). Don’t worry about it. When he or she is a little bit older, at two months or so, you can feed your baby while still not too tired and then put a tired, full baby to bed half an hour later. This one is not new to you, I’m sure. This is what all parents do, right? But a reminder of how much it helps might be good when deciding on where the baby shall sleep during his or her first months. Two of my kids slept in a cradle during their first four months. Our youngest slept in a regular crib. Not good. How do you rock a crib?? Well, you could buy Vyssanlull feet to the bed, a great Swedish invention. You just put them onto the crib’s legs and – tada – you have a rocking crib. Great help. If you can’t find any of these in your country, and you don’t want to invest in a cradle, you could use buy either a rocking crib like the DaVinci Alpha Mini Rocking Crib or a similar one or use your stroller. (Although, there might be safety issues involved. For example, the baby could fall out.) If you use your stroller I suggest that you only use it when you are awake. My last suggestion is to put your baby in his crib on a flat pillow (again, check safety issues), not only his head but a large part of his back. When he starts waking up, gently rock his upper body by slightly lifting the pillow up and rock it gently. It is of course not ideal that the infant needs to be rocked to go back to sleep, but as a means to lengthen the time between his nursing moments, I think it is a great method, at least it has worked for me! This may also help a hungry baby sleep better. Feed him until he doesn’t want more. Do it every second hour or even more often in the evening. Mom and milk are usually what babies want the most when waking up. With a stuffed animal with your smell on it, your infant might not feel as lonely when waking up in the middle of the night. Put the animal close to your body for a few day and nights and then give it to your baby every time he goes to sleep. However, you need to use a small stuffed animal, to make sure that it can’t cover your baby’s face. I know many babies that fall asleep almost instantly if their face is covered by a very thin cotton cloth. I suppose it helps them shutting out distracting visual impressions. 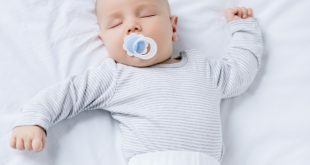 Try this for naps rather than falling asleep at night, and don’t leave the cloth with the baby out of your sight (for example at night) if you think there is even a remote risk that the baby could be suffocated by it, or that it could impact his oxygen uptake, and increase the risk of SIDS (Sudden Infant Death Syndrome). Do you have a very enthusiastic night time feeder? Try reducing the length (hence the amount) of every occasion, thereby slowly teaching him to eat less at night. Small children usually have a strong need to suckle. Both my youngest kids did not, however, accept a pacifier until they were 2.5 months old. So hang in there! And try some different kinds. Some children need some help to learn how to use the pacifier. Having learned, it might be a lot easier for the baby to fall asleep in his bed instead of at your breast. As an important bonus, recent research indicates that a baby sleeping on his back, using a pacifier runs an extra low risk of SIDS. Check this with your care provider! Babies who are too warm or too cold wake up more easily. Some sort of baby sleep bag might be of great help, as it keeps the baby warm: Also, there is no risk that the baby either kicks off the blanket or pulls it over his face. I can truly recommend a Grobag or a similar cheaper baby sleeping bags, like this one!. This Grobag baby sleep bag is quite expensive in my view, but is really good and has won several awards for best nursery product in the UK. Actually, even if your infant doesn’t sleep better in a baby sleep bag, you might! At least I did when I could stop worrying about my baby pulling the blanket over his face. Some babies tend to start doing this when a few months old. Ahh, I almost forgot the most important point! To give you an example – ten months old, my daughter still woke up every second hour to nurse. We decided that we had to do something drastic. Starting a Friday night, her dad took her up when she started crying at night. He rocked her in his arms, gave her the pacifier and – believe it or not – she went back to sleep within minutes. After only three nights, she only woke up twice a night. At these occasions, we let her eat because she wouldn’t settle easily with dad. One month later she only woke up once and at the age of one, we did the procedure one more time to take away the last night time meal. It also only took a few days. WHAT a RELIEF! So WHY didn’t I try earlier??? Don’t do the same mistake! Work as a team with your spouse to improve your family’s nights. Babies weighing more than 10 pounds (don’t they all, almost?) and at least at 6 months don’t really need to eat at night. (As always check your specific situation with your care provider). You can learn more about this method and other ways to stop nursing a baby to sleep here. That was it… These tips above will take you a long way, I promise! But if you want more detail, I suggest you get yourself a book or an audio book on the topic. My favorite infant sleep book by far is the “No Cry Sleep Solution“. You can read my review of it here. Now how do you survive until your baby sleeps better? Follow this link for some tips that don’t really help your infant sleep better, but you! Do you still need help with your baby’s sleep habits? Browse the large number of baby sleep questions asked and answered at our Baby Help Line. 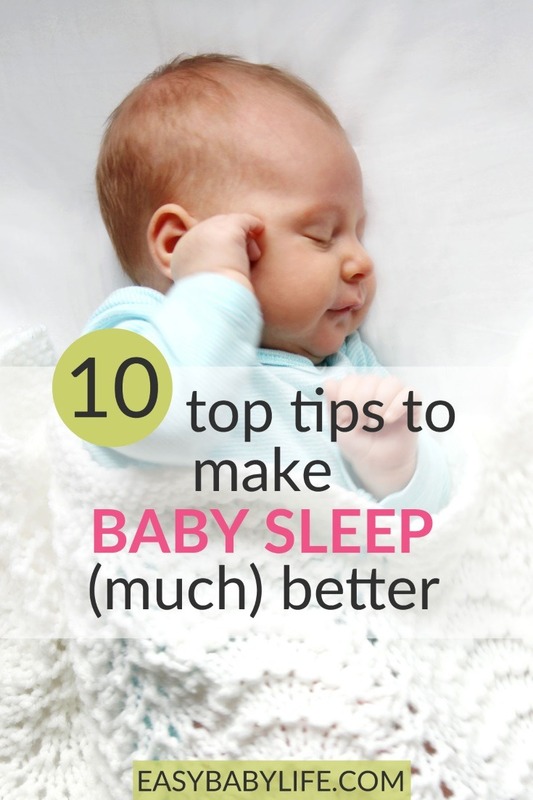 Do you have any additional tips to make baby sleep! Share them below! Lots of new parents (and babies) will thank you!